Great news for those of you getting the David Baumgart Add-Ons! David has sent me a batch of new and improved graphics to include in his Add-On collections. The buildings/structures are now going to be available as separate elements that you can place over whatever terrain tile you want (as opposed to them being "baked into" only certain terrain tiles). A fair number of houses are also going to be individually placeable, so if you want to show some crazy hunter's cabin out in the middle of nowhere, now you can. That alone is pretty great, but he's also thrown in some new buildings (e.g., a necromancer's castle), including some for non-human settlements: a dwarven fortress, an elven lodge, and halfling dwellings. David has also added various decorative elements (e.g., wells, signs, crop fields, corrals, tree stumps, etc.) that you can use to customize your maps even more. So in short, what was already going to be a great Add-On collection has just leveled up. Bruce Meyer, snon, and 5 more people like this update. @Marty, I'm not sure if demand for the square-based assets would be all that high, enough to warrant a MapForge-specific port of the collection. One could always use the current assets via drag-and-drop, though that's far from ideal. I'd like to someday add a staggered-square grid option to MapForge (the squares would be arranged much like like bricks in a wall), and that arrangement might make such maps more visually interesting with David's assets. @Bruce, sorry, it totally slipped my mind that Hex March Vol. 1 is also called "World Map Builder" (at least on the Roll20 Marketplace). @Battlegrounds Games, LLC I was talking about the Meditating Munky Hex March Vol 1 - World Map Builder and Vol 2 icons. Your update #9 has the preview of the new icons I was looking for, thanks! @Crassus, There are two Hex March volumes. David Baumgart's Add-Ons are sold in a full collection (they can't be purchased individually) compiled from 6 distinct products, which I liked to on the Unity Asset Store. This collection is offered in 2 versions, one for Personal Use, and one that allows for Commercial Use. In the campaign section I only see 4 add-ons. Where are the additional add-ons listed? @David, I'll suggest the idea to your namesake. Though I'm not sure if David's painterly style works well with the Hex March style. I know that the map icons I'm colorizing definitely DON'T look good on David's tiles. That is really awesome for those getting the painted tiles. Since it seems we will not reach stretch goal #2 here is something to consider (if possible/the artists agrees): Perhaps, if the styles look good together, you could offer just the buildings/structures as a separate add-on. Not a stretch goal, but a small paid add on that could be used with the Hex March and any future or user imported tiles. @Bruce, what's "world builder"? There are plenty of pics and preview videos posted of David's artwork in general, but if you mean specifically of the new content that I'm referring to in this Update, there's nothing currently posted. I'll see if I can whip something up and will post a link here if I do. 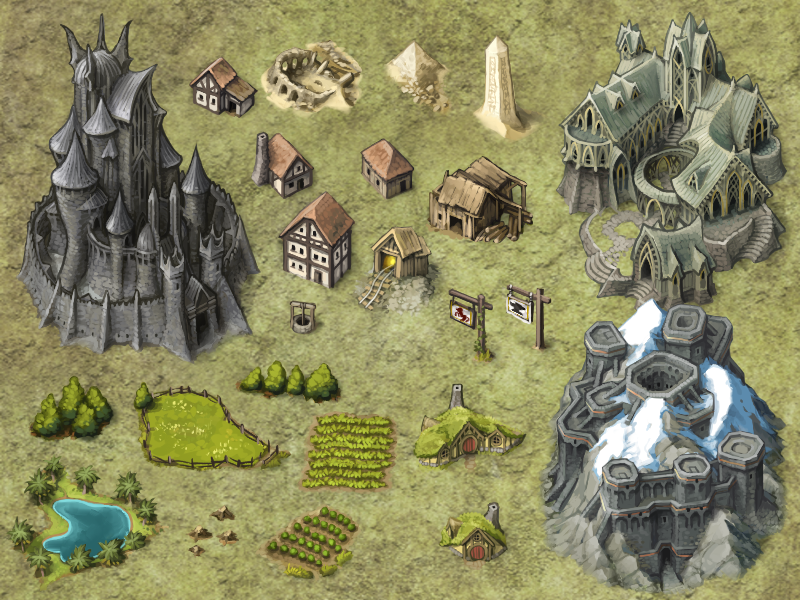 My current pledge amount is for the two (world builder and the north) other sets. This sounds really awesome and I may change my level to get this, but is there anyway we can get some previews of the icons in use?